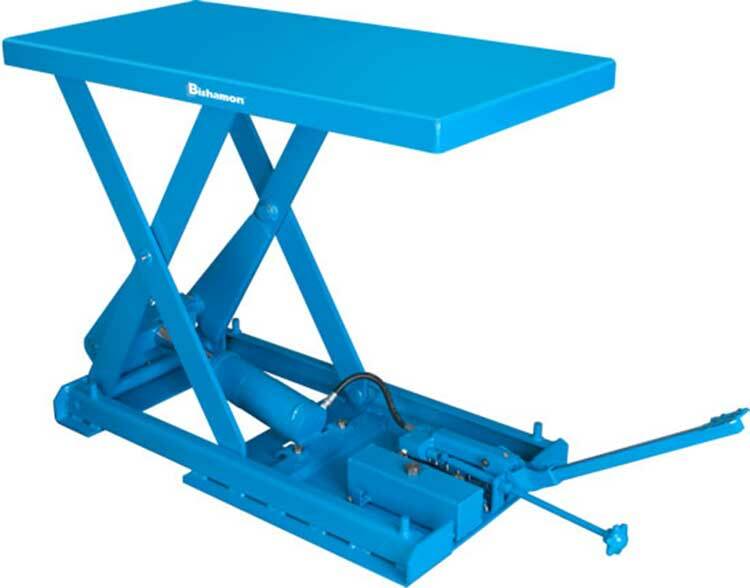 The Bishamon CompacLift™ X-Series Scissor Lift Tables are ideal for production line manufacturing activities that require heavy-duty lifting and positioning. They were designed to be ergonomic, durable, and convenient. CompacLift™ tables come in manual, electric and air operated models. Manual models are operated by a removable and storable foot pedal while electric models include a convenient hand control. All models feature a compact design that is suitable for a limited work area. Made with heavy-gauge steel and sturdy welds, these tables are strong. Entrapped rollers serve to enhance stability, while a quality baked enamel finish protects the tables from harsh environmental conditions. The rugged ComacLift™ tables can survive tough working conditions with minimal maintenance. The X-Series CompacLift™ tables facilitate worker safety and efficiency. These tables minimize repetitive lifting activities and reduce worker strain. They position materials at optimum operating heights, facilitating comfort and productivity. The tables are available in five different capacities, four table sizes and single or double scissors, for almost any application. X-20C 16″ 440 lbs. 19.5″ x 25.5″ 5″ 21″ 28 – 121 lbs. X-25C 22″ 550 lbs. 19.5″ x 32″ 6″ 28″ 42 – 157 lbs. X-25E 22″ 550 lbs. 19.5″ x 32″ 6″ 28″ – 9 / 7 190 lbs. X-25P 22″ 550 lbs. 19.5″ x 32″ 6″ 28″ – 36 190 lbs. X-50C 25.5″ 1100 lbs. 20″ x 40″ 6″ 31.5″ 46 – 253 lbs. X-50P 25.5″ 1100 lbs. 20″ x 40″ 6″ 31.5″ – 40 285 lbs. X-75C 25.5″ 1650 lbs. 20″ x 40″ 6″ 31.5″ 67 – 256 lbs. X-75E 25.5″ 1650 lbs. 20″ x 40″ 6″ 31.5″ – 17 / 14 288 lbs. X-75P 25.5″ 1650 lbs. 20″ x 40″ 6″ 31.5″ – 58 288 lbs. X-30SC 45″ 660 lbs. 20″ x 40″ 9.25″ 54.25″ 54 – 315 lbs. X-30SE 45″ 660 lbs. 20″ x 40″ 9.25″ 54.25″ – 14 / 11 345 lbs. X-30SP 45″ 660 lbs. 20″ x 40″ 9.25″ 54.25″ – 47 345 lbs. X-50SE 25.5″ 1100 lbs. 18″ x 25.5″ 8.25″ 33.75″ – 14 / 11 235 lbs. X-50SP 25.5″ 1100 lbs. 18″ x 25.5″ 8.25″ 33.75″ – 47 235 lbs.